The Room is a generative project that sees the collaboration between two filmmakers/visual artists, Luke Fowler and Peter Todd, with musician Keith Rowe, with live music accompanying two 16mm films. 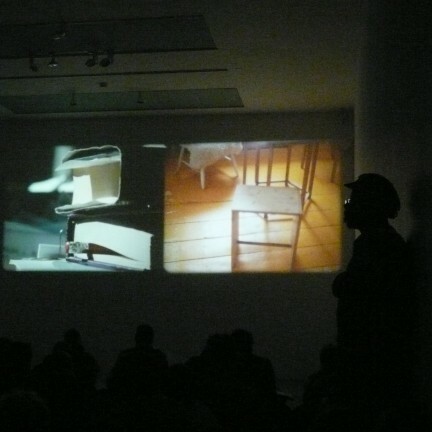 The first version of The Room was presented in 2008 at the Tate Modern in London in Expanded Cinema for Rothko during the large Mark Rothko retrospective. The second presentation was held on the occasion of the Cornelius Cardew and the Freedom of Listening exhibition at CAC Bretigny, the third at the Play festival at La Casa Encendida in Madrid in 2010. Netmage 11 offers it a fourth time, configured as an unpublished work generated from previous experiences and dialogues. The Room is a collaboration among artists, a research that revolves around the entity of the stanza: previously uninhabited spaces containing the residue of human activity, of archival impressions from historical or daily events, of artistic activity, of personal effects and affects, of chance. In several cases the three have been attracted by the spaces’ specific acoustic qualities: hidden frequencies, sonic phenomena, internal voices and interferences, movements of light. Each has worked independently on the process of constructing the work: with each new presentation a new room is added, filmed by either Fowler or Todd, with a Bolex loaded with 3-minute magazines, adding interventions to the room that are adapted to the specifics of locale and context. Keith Rowe reinterprets these visual ambients live, with lengthy guitar solos. In this way, The Room takes the form of a fascinating artifice where the topography of an impossible edifice blurs its borders and passes again through historical and personal space, between the sublime and the everyday. Luke Fowler lives in Glasgow and is known in the world of contemporary art for his earlier pictures of radical social experiments such as What You See is Where You Are At (2001) of Kingsley Hall in the ’60′s and Pilgrimage From Scattered Points (2006) of Cornelius Cardew and the Scratch Orchestra. He was among the artists in the Tate Triennial in 2006; in 2008 he won the first Jarman Award and in 2010 the Contemporary Art Society Annual Award for Museums. He has had solo shows at the Serpentine Gallery in London, IMO in Copenhagen, and Kunsthaus in Zurich. His work A Grammar for Listening (in collaboration with Eric La Casa, Lee Patterson and Toshiya Tsunda) was presented at the Rotterdam International Cinema Festival and The British Art Show 7. Keith Rowe is a painter and guitarist. In the mid ’60′s, Rowe was one of the founders of the free improvisation group AMM, and is considered the father of electroacoustic improvisation. In his research, painting is a source of inspiration for musical performance. He plays prepared guitar with a near-surgical attitude, with a variety of techniques: laid on a table and manipulated with the body to obtain sounds that are exotic, obscure and alien; intervening with his instruments with objects (credit cards, erasers, clothespins, handheld fans, clips and various bits of trash..) and incorporating live radio transmissions, heard through the guitar strings as well as directly through amplifiers. Peter Todd was one of the founding members of the artist-run space Ayton Basement in Newcastle Upon Tyne at the end of the ’70′s (later changed to the Basement Group, which he co-founded, and in the course of time became Projects UK, today known as Locus +). He is known for his collaborative projects, as a cinema programmer as well as an experimental cineaste.